My great great grandfather, Thomas Moss (1820-1856), was in the Wakefield Troop of The First West Yorkshire Yeomanry Cavalry. 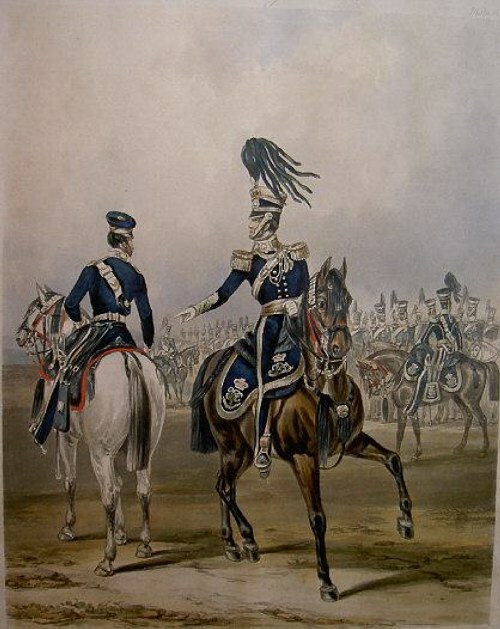 Both his father and father-in-law, Enoch Moss (1798-1871) & Thomas Barmby (c.1785-1850), were in the Wakefield Troop of The South West Yorkshire Yeomanry Cavalry, which was re-named The First West Yorkshire Yeomanry Cavalry. 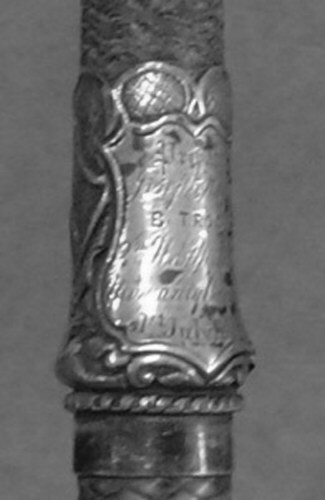 This was a volunteer regiment and all of its members had other types of income; many of the troopers were tradesmen. 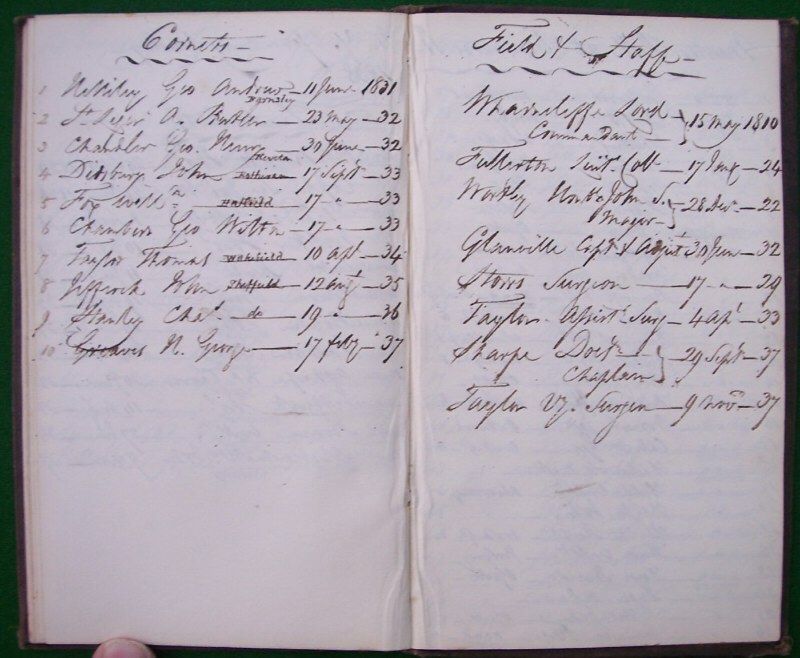 It was common at that time to hold two different, often connected, forms of employment such as 'Solicitor' & 'Clerk of the Court'. 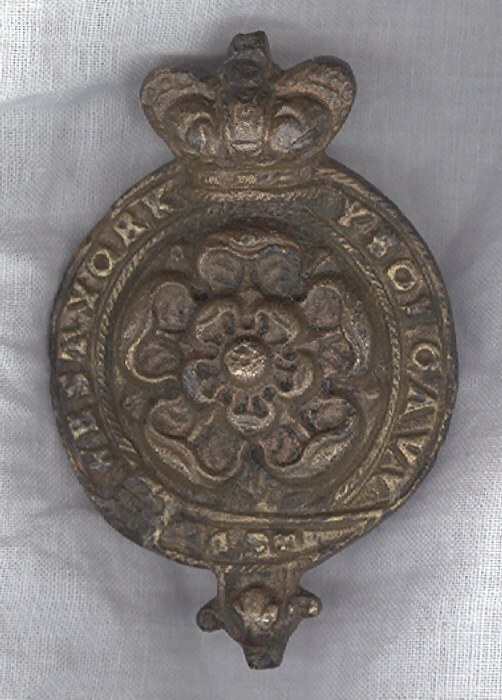 Enoch Moss & his son Thomas were both Sheriff's Officers & worked as Auctioneers in the firm of Child & Moss at Wakefield, Yorks. 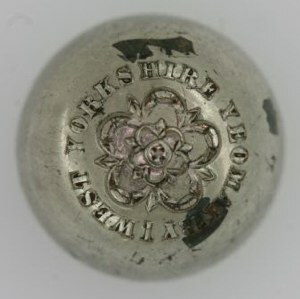 Thomas's father-in-law, Thomas Barmby, was a Coal Agent in Wakefield, Yorks. 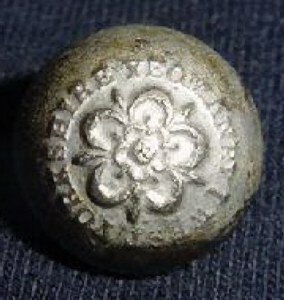 SWYYC - South West Yorkshire Yeomanry Cavalry button from the early 1840s. Thomas Moss was involved in the Chartist Riots of 1842, when his Regiment was called out to keep the peace and were sent west towards the Brighouse Riots in Huddersfield, Yorks. The system for dealing with riots was that troops from the neighbouring towns would be sent to the area suffering from public disorder, and troops from the next towns outwards from the centre of the riots would move in to take their place. This would be repeated outwards for a considerable distance, thus giving a constant supply of reinforcements and safety to surrounding areas in case the riots spread outwards. However, it meant that many towns that were far removed from the riots were left without full troop protection. These Regiments had originally been formed as a type of 'Home Guard' to protect the country from possible French invasion; many of these troops were later to serve with honour in the Boer War and both World Wars. Some of the old Cavalry Regiments evolved into The Machine Gun Corps (as did my paternal grandfather's Regiment, The South Notts Hussars, in the 1914-18 War), then the Tank Corps in the 1939-45 War. The original 'S.W.Y.Y.C. 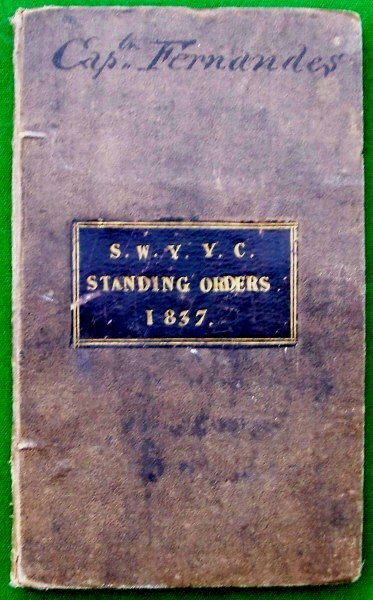 Standing Orders 1837' book belonging to Captain Jose Louis Fernandes of the Wakefield Troop of the South West Yorkshire Yeomanry Cavalry. In 1838, Capt. 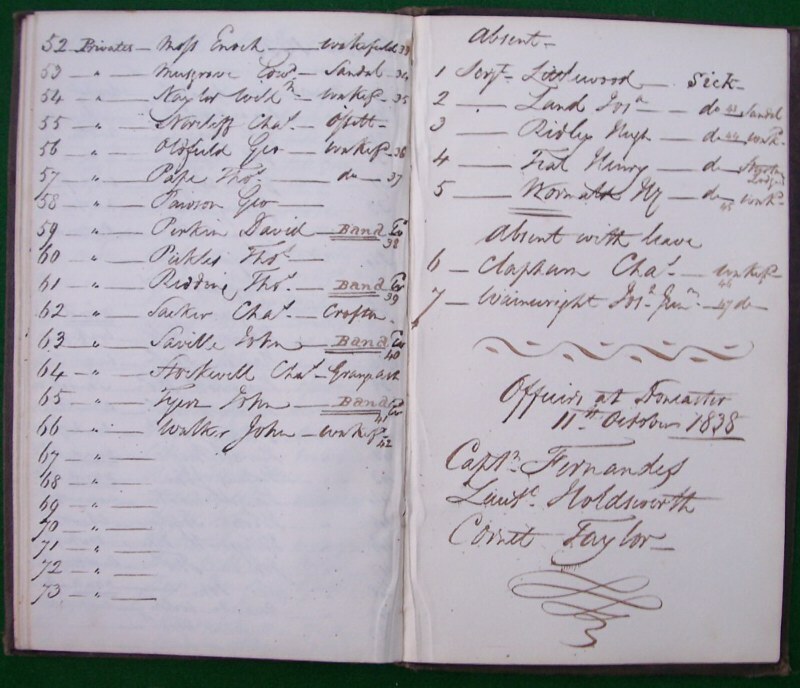 Fernandes recorded the names and ranks of the Officers in the Regiment, and the NCOs and Troopers in his own Wakefield Troop (see below); this list includes Private Enoch Moss, the father of Thomas Moss (see '52 Private Mofs, Enoch' at the top of the 7th page below). 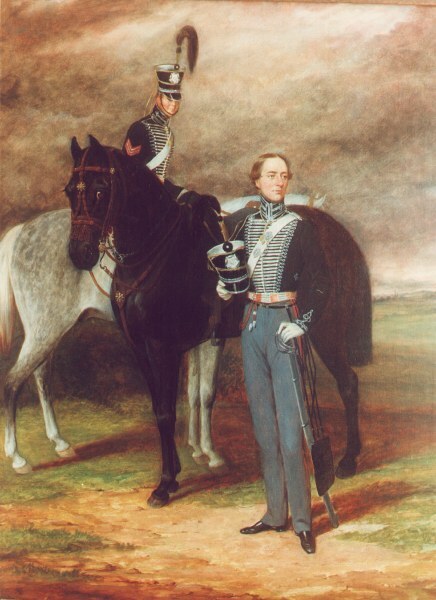 Thomas Moss and his future father-in-law, Thomas Barmby, also joined this Troop in subsequent years. 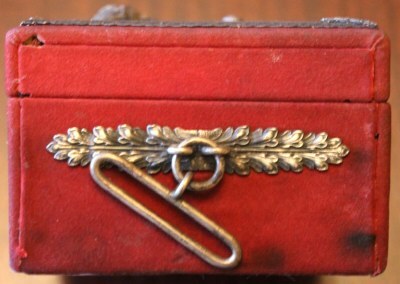 There is a very interesting website about Captain Jose Louis Fernandes' family history, which also mentions the future Captain of the Troop, John Naylor, and their dissolved business partnership: caliendi.com. 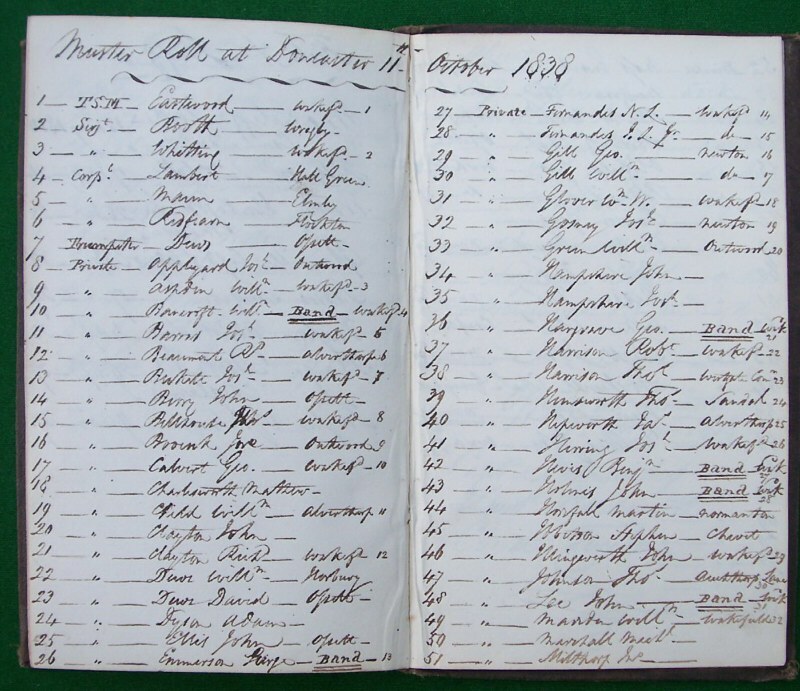 If anyone can help with further information about these ancestors or their Regiment, I'd be delighted to hear from you. 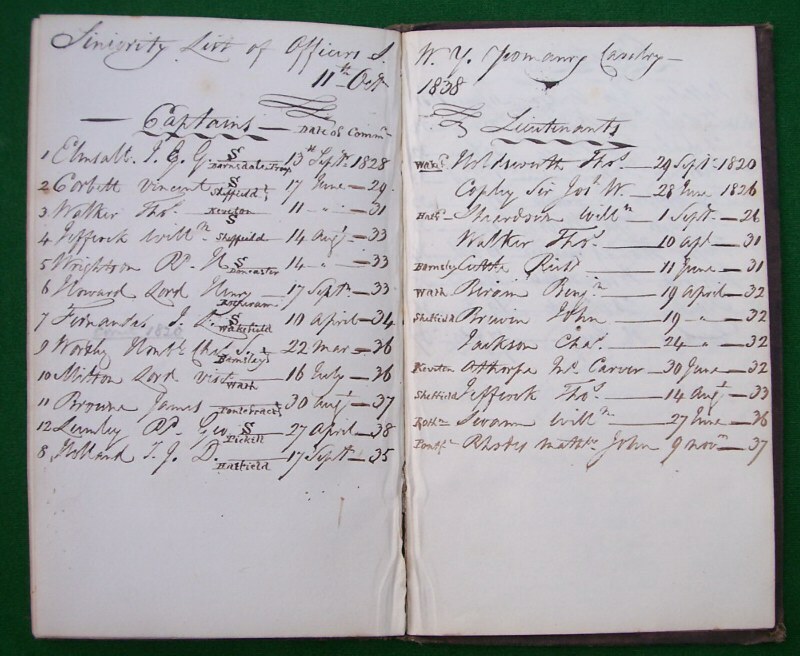 If anyone else is researching this Regiment, I may be able to help as I have accumulated about 700 pages of research about this family and their Regiment, including 'Troop Movements' during the Chartist Riots and the 'Annual Review of the Regiment' at Doncaster. to Mr. Thos. Moss Corpl. 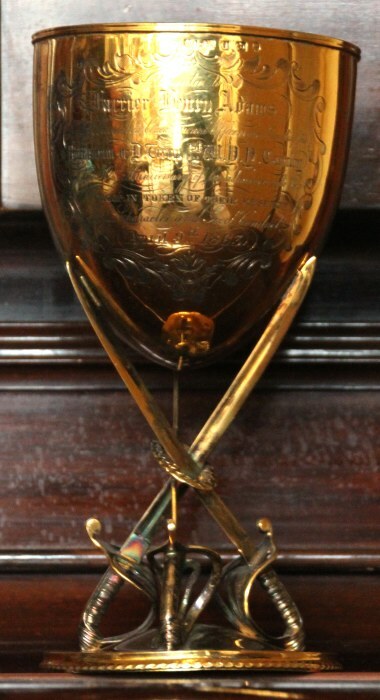 1st West Yorkshire Yeomanry Cavalry: 1840s shako and shako badge; 1890s Boer War period brass helmet. 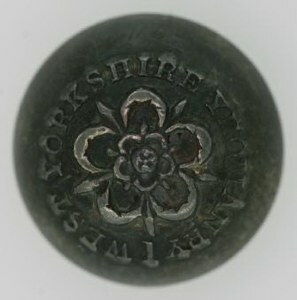 Buttons without crowns from the 1840s & 1850s, with '1' below indicating 1st West Yorkshire Yeomanry Cavalry. 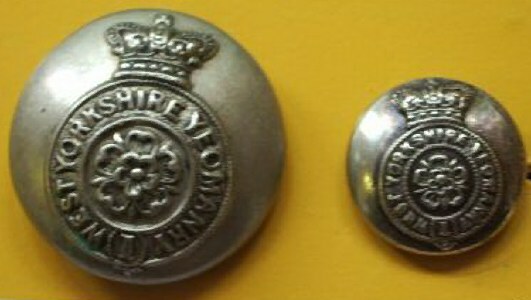 Buttons with crowns from the Boer War period, with '1' below indicating 1st West Yorkshire Yeomanry Cavalry. 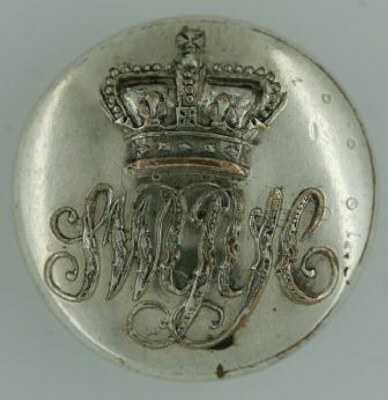 1st West Yorkshire Yeomanry Cavalry Regimental horse-harness badges, c.1840/50. 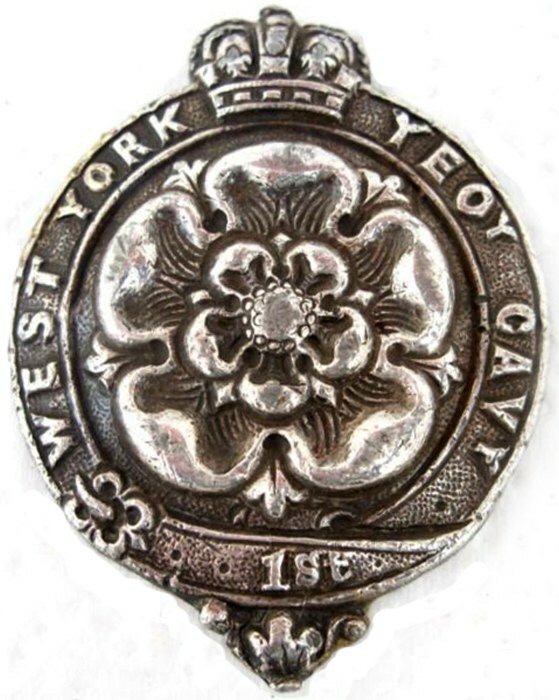 1st West Yorkshire Yeomanry Cavalry Regimental horse-badges, marked "West York Yeoy Cavy 1st" on ribbon around the central Yorkshire rose with a crown above. 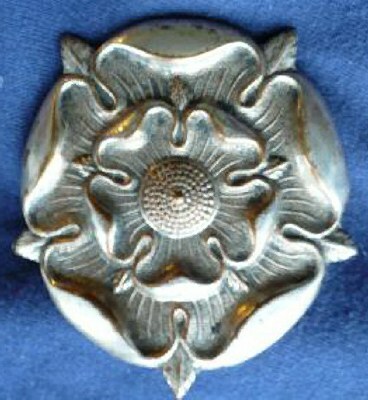 This was mounted on the side of the harness headset, just above the eye on each side (see 'Horse Guards' photo below). 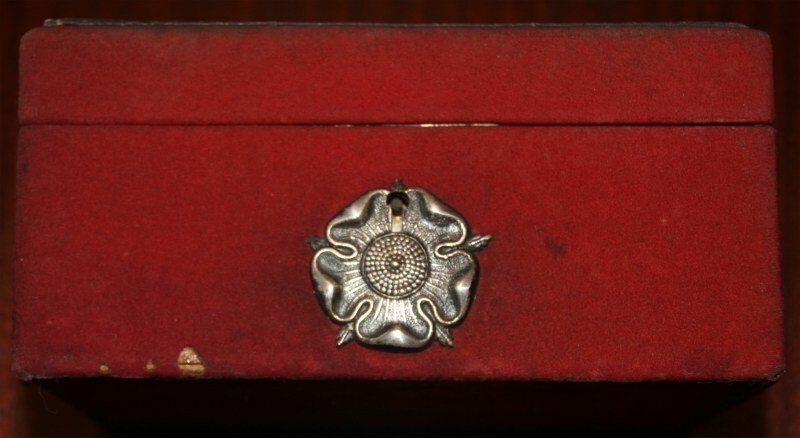 It is made of heavy brass with two thick straight studs on the back, which must have been pressed into tight holes in the leather, as there are no signs of any thread, pin-hole, or clip method of fixture. 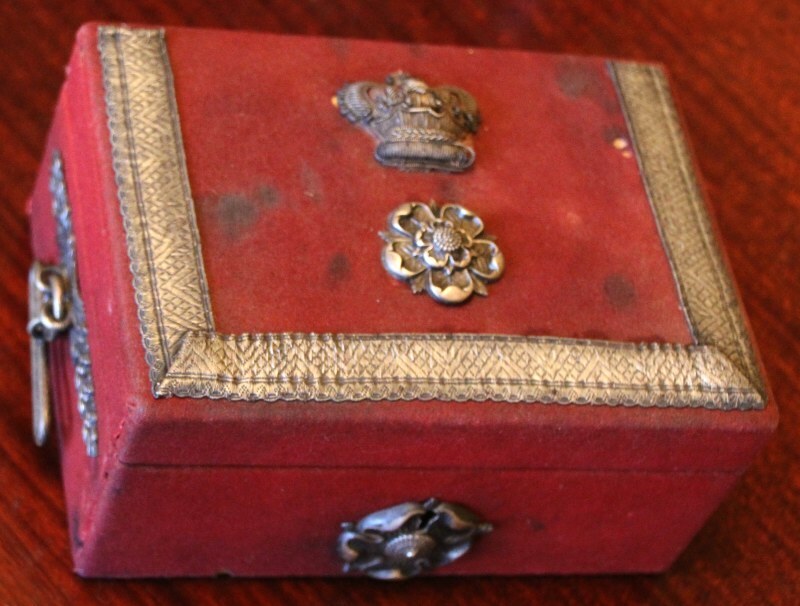 It was probably dislodged and lost during the Annual Review at Doncaster where it was found over a century later by a local resident. 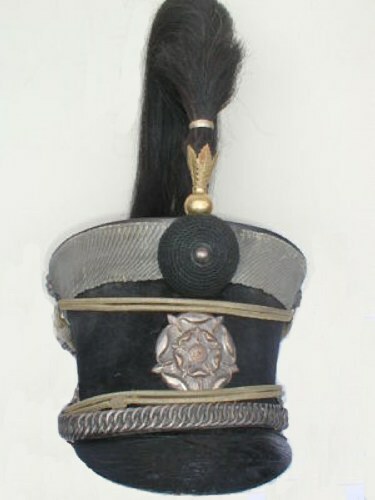 There was also a large 'star' badge on the forehead and breast areas of the horse harness. 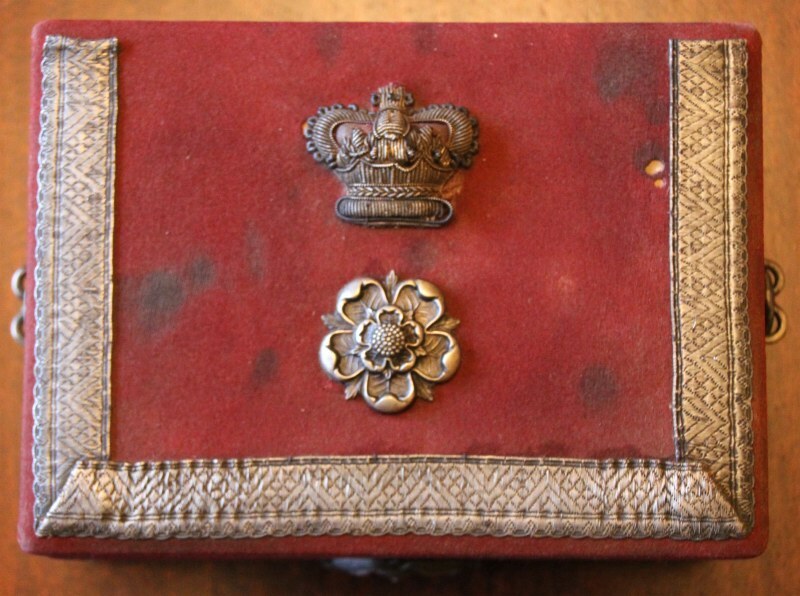 1st West Yorkshire Yeomanry Cavalry Despatch Box c1840s. 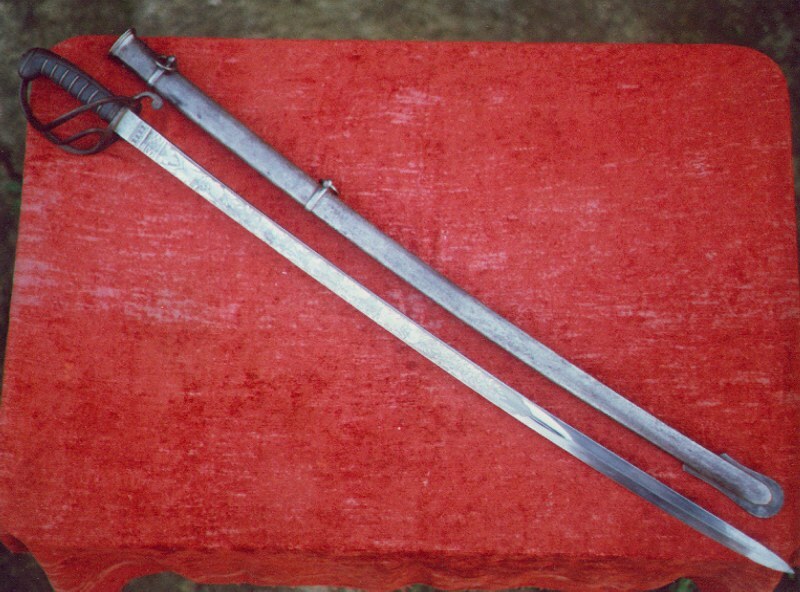 There is a small, but excellent, military history collection at Doncaster Museum, which includes a brilliant display of 1st West Yorkshire Yeomanry Cavalry items. Doncaster Museum, Chequer Road, Doncaster, DN1 2AE; tel: +44 (0)1302 734293. 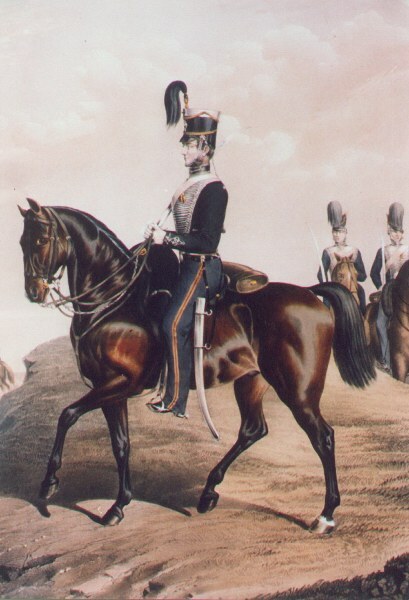 An Officer of the 2nd West Yorkshire Yeomanry Cavalry in 1846, from an original print by Fores. You will see the significant uniform difference between the 1st & 2nd West Yorkshire Yeomanry Cavalry; e.g. 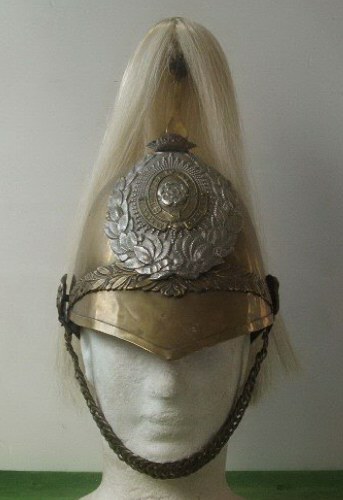 the 2nd had no 'Hussar bands' on their tunic. NB. 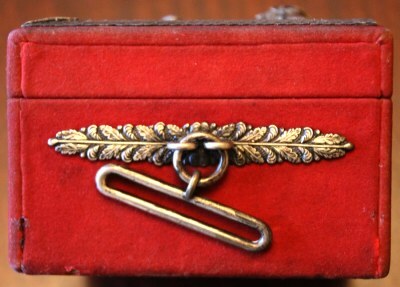 There is a badge located on the side of the head-harness, as in the 1st WYYC paintings and badge above.